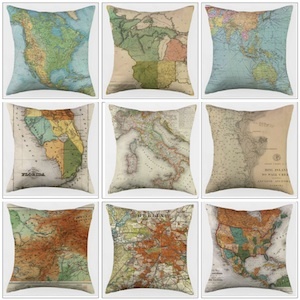 Ashbee Design: Map Pillows • Where are you from? How large is your hippocampus? I always know where in the world I am. It has always been that way and we always assumed it was because I love maps. I am always studying them and as a result I often override the GPS in our car. It wasn't until my sister-in-law Cindy sent me a link to this article from The Week on one's hippocampus that I understood I must have a very large one. These pillows are from designer Robbi Lindeman and handmade by SaltLabs Studio. 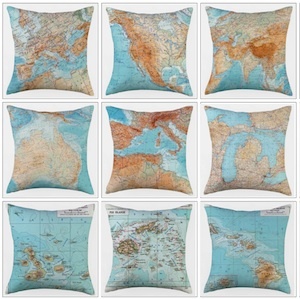 They available online (along many other beautiful designs) from their site here. I'd love one of my hometown although I don't think they are custom made. One of the old country would also be a great gift for a grandmother. Or one of Manhattan for the displaced New Yorker. It seems like the right gift for so many people.